Here at TLS, we spend a good chunk of our day outside. One of my favorite sayings heard around here is that there is no such thing as bad weather, just bad clothing. If we are not on one of our many super cool play spaces, then we are often taking advantage of the woods surrounding us, the creek bed, and an all time favorite, the Magic Tree. Many of our parents ask about this much talked about “Magic Tree.”What is it? Why is it magical? I offered to take a parent there once, but he insisted that he keep it in his imagination. I am here to lift the mysterious veil. Here are the Magic Tree stats: It’s a small clearing with a large tree that has fallen over onto a few other smaller trees. Does that sound magical? Not really, but that’s because we are boring grown-ups. When we first opened this campus, the Pre-K kids discovered it on a walk and gave it the famed name. Since then it has been turned it into a rocket ship, a balance beam, a kitchen, a super-hero hide out, a canvas, a set of monkey bars, an excavation site, endless tunnels, a fire station, a loom, a fort, a zoo (both real and imagined), a pirate treasure box, a fairy treasure box, a meeting place, a quiet place, a loud place.... and the list goes on. In the winter it is a bright spot surrounded by crunchy leaves and naked trees. Come spring, we are literally watching the tree buds unfold in front of us. In the summer it is a cool escape from the Carolina heat, and the fall? I can’t even begin to describe the autumnal palette that falls from the trees. What makes this place magic is of course our kids. Where you and I may see potential firewood, they see unlimited possibilities. There is one big lesson that we as a school can take from the Magic Tree- an amazing playspace is not always a big expensive play structure. It is a beautiful space and opportunity to explore. 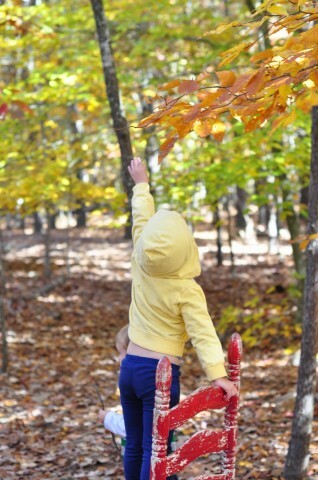 A zillion studies herald the virtues of playing in nature from increased gross motor skills, agility, stress reduction, cognitive development, improved social interaction, independence, healthier immune systems, and of course a respect for nature. Our dream for our playgrounds are lots and lots of magical pockets. You can’t build magic overnight. This is a large part of why our annual gardening day is so important to us. Every year we ask parents to offer a few hours to come together as a community and plant (or chainsaw as the case may be?) a little extra magic on our playspaces. If you have the time to help us get there, then grab a shovel and some pixie dust and join the party April 21st.